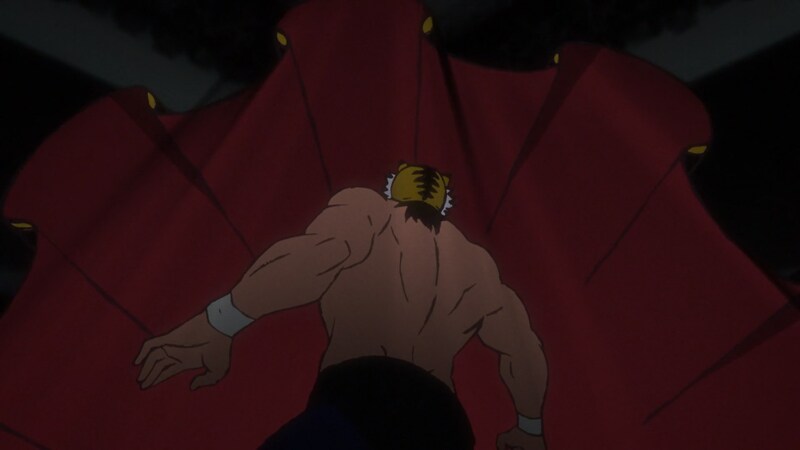 When it comes to anime, Tiger Mask’s legacy mostly lives through Keiichiro Kimura’s legendary opening sequence, which stands as an incredible animation achievement for a 1969 production. That striking rough linework is remembered with such fondness that the series reboot went as far as requesting a fairly similar artist like Yoshihiko Umakoshi to draw the ending for the new TV anime, and even experimented with heavily filtering the lineart in-show to achieve similar results with regular drawings. But as I said earlier, Tiger Mask W is merely the framework allowing me to bring up two artists rather than the focus of this post. 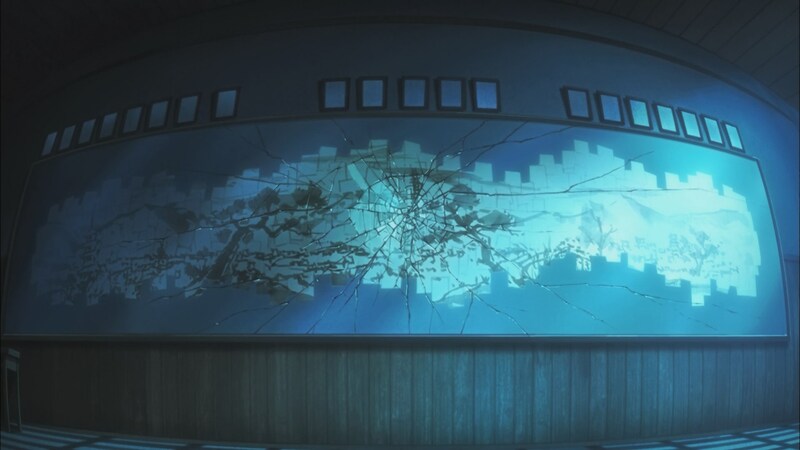 Even the official account – which has notoriously been friendly to production fans – hyped this week’s key staff as the youngest duo, proudly proclaiming that Haruka Kamatani would direct the episode with animation supervised by Kodai Watanabe. Not with baseless confidence, since these two embody Toei’s future and could become their best assets if the studio convinces them to stay. 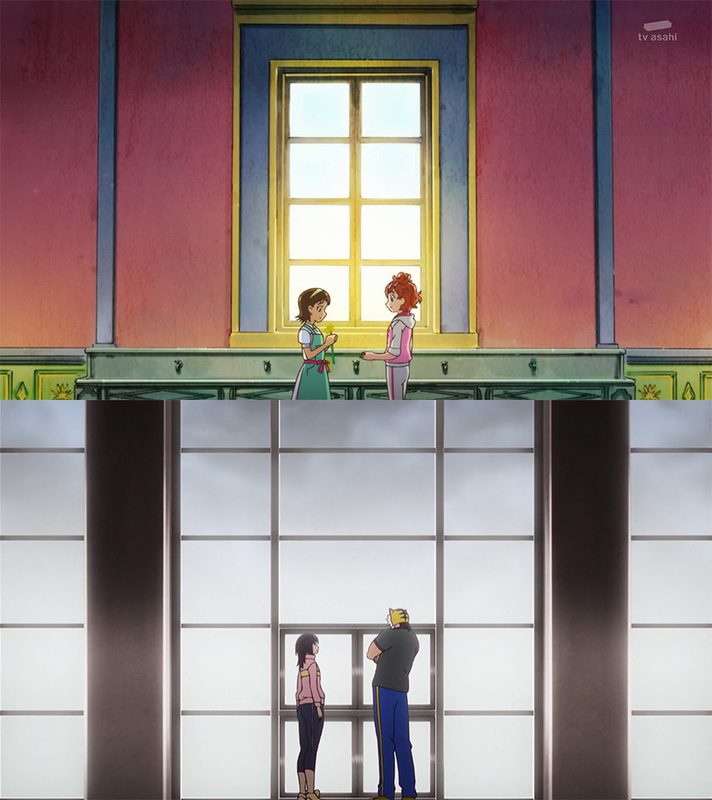 Precure viewers might be acquainted with Kamatani’s name already, since that is the franchise that saw her creative explosion over the last few years; her training grounds were mostly in One Piece where she did quite a bit of episode direction assistance, but she eventually moved with that same role to Precure and stayed there until she got promoted and joined the director rotation for real. She kept on climbing the ladder on the franchise too, to the point of being trusted with many of Go! 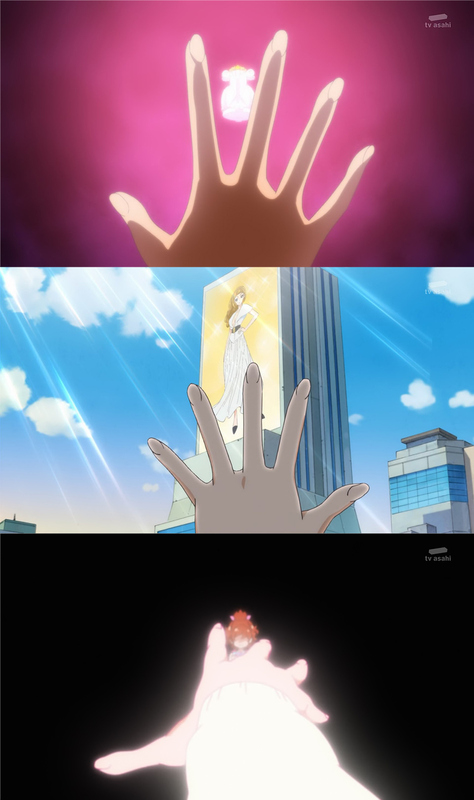 Princess Precure’s most important episodes and storyboarding some stock footage for the current series. Her actual directional debut was a one-off opportunity elsewhere though – one that shaped her style quite heavily! 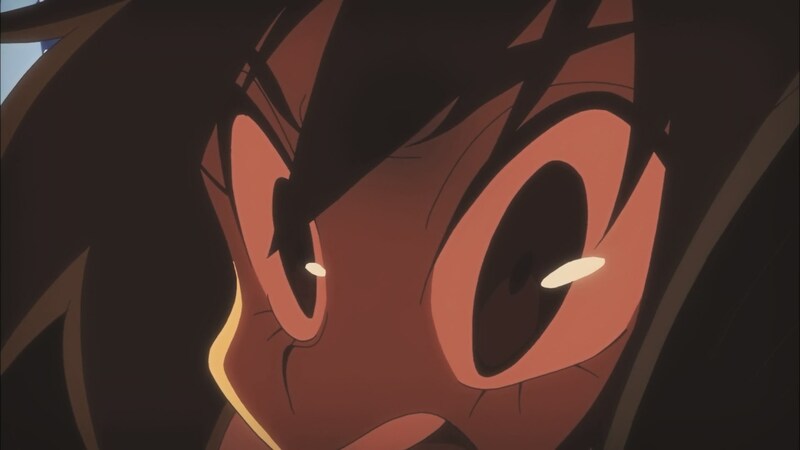 Her first chance was on Kyousougiga #7, storyboarded by Rie Matsumoto herself; it’s no wonder that Matsumoto’s tricks have become part of Kamatani’s lexicon, and that they’re obsessed with the same imagery. 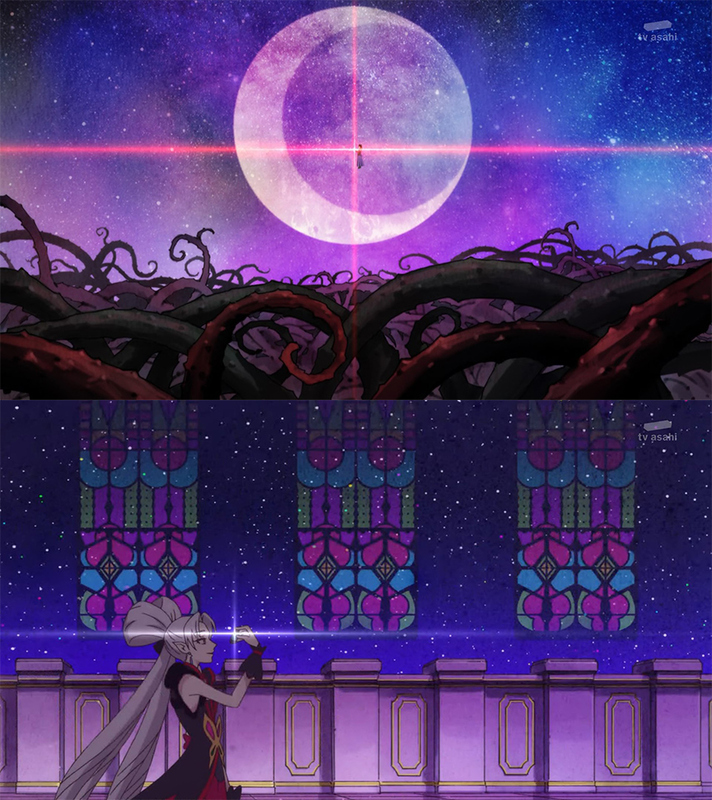 Even the way the disciple of sorts approaches scene composition is rather similar, and she had the skill to evolve beyond being a mere copycat. 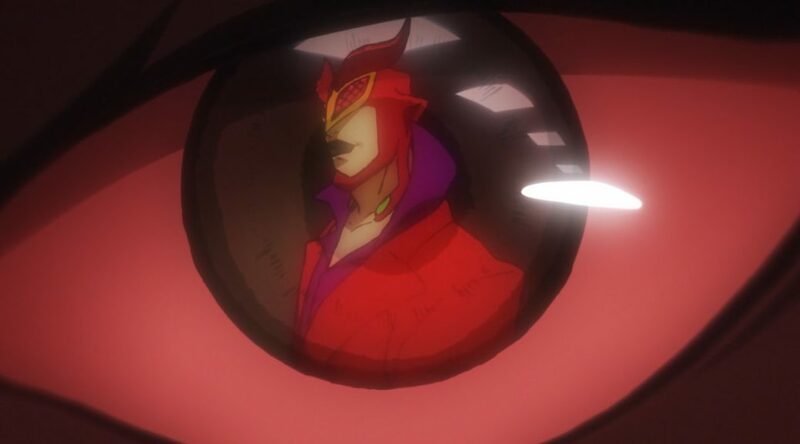 As you can imagine Matsumoto isn’t the only influence over Kamatani as a director though, her friend and usual GoPri collaborator Yuta Tanaka also had a noticeable impact on her framing. I have no doubts about her own talent, but having been able to learn from the studio’s best sure helps. While it’s by no means her magnum opus, Tiger Mask W #4 immediately greets you with Kamatani’s captivating style. 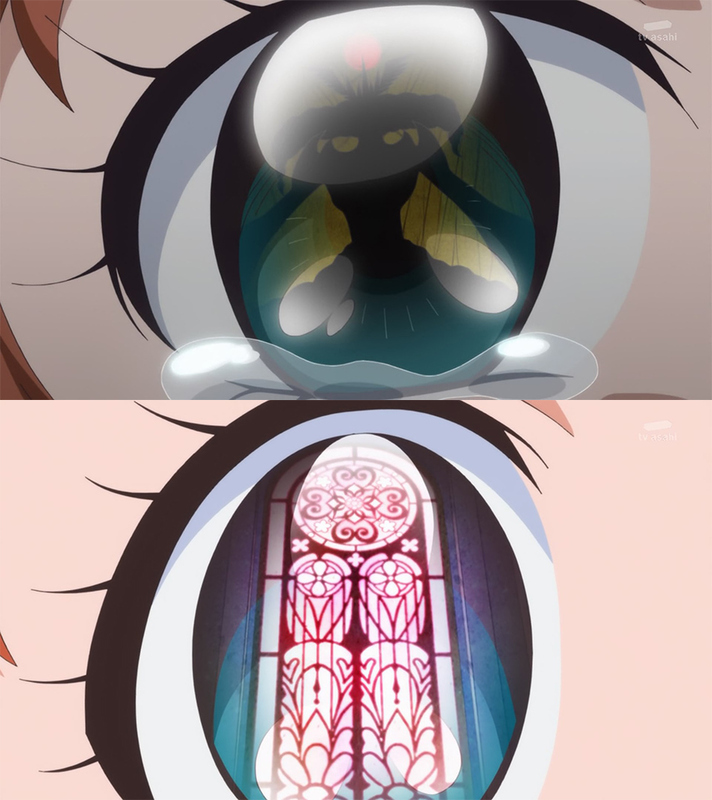 Her boards are unmistakable, and recurring themes like ominous eye reflections quickly make their appearance. The best directors aren’t just a set of gimmicks though, and she clearly understood what she was doing with this particular episode. Lots of care was put into making the enemy’s Red Death Claw move feel intimidating – it constantly traps the viewers themselves, even when it’s not actually a hand but something meant to evoke it, and its portrayal from the attacker’s point of view always feels overpowering. It’s actually rather amusing to see Kamatani use hands in this aggressive fashion, since her episodes have often used them as means to represent chasing dreams. 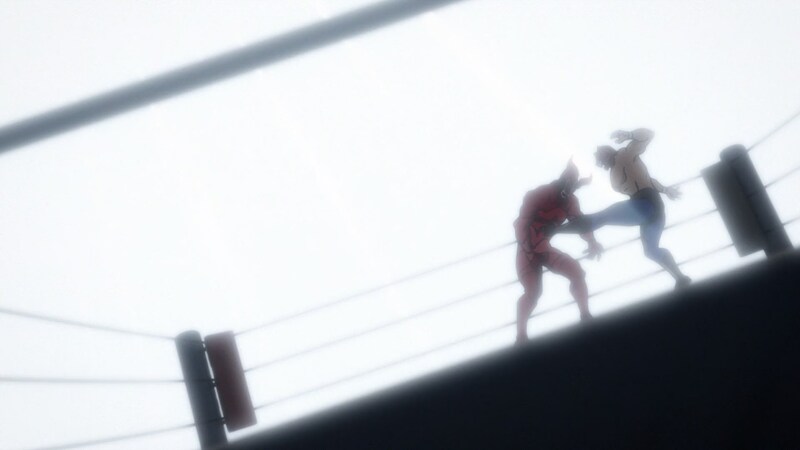 Once the titular hero finds strength in his companions and eventually beats the cruel villain, the tables are turned; white takes over the screen, beautifully reversing the shot dominated by black when the cruel Red Death Mask won the previous match. It’s not as if the episode has Kamatani’s full repertoire on display – not like she had a chance to show off her super robot passion this time! – but it’s serviceable as an introduction, and a really strong offering in and of itself. Since the very beginning I have been talking about a duo though, so there clearly is someone else. The animation director happened to be Kodai Watanabe, a very impressive young animator who could easily be considered Yuki Hayashi’s successor; his first supervision role was in the second half of a Hayashi episode of Toriko, he debuted with minor design work on Hayashi’s Driland and quickly became a proper character designer in the series’ sequel. 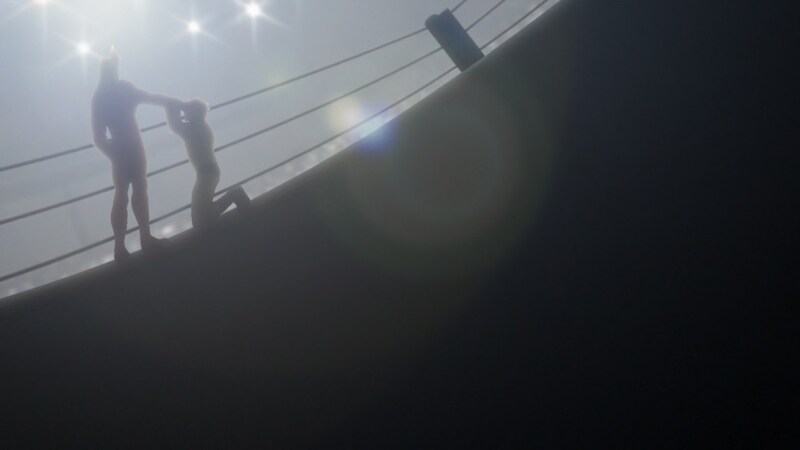 Their careers stayed tied after that, as Watanabe followed Hayashi to Kyousougiga and even recently worked with him – both under pseudonyms – for the Kekkai Sensen OVA. Their bond can’t be understated. What about him as an animator though? 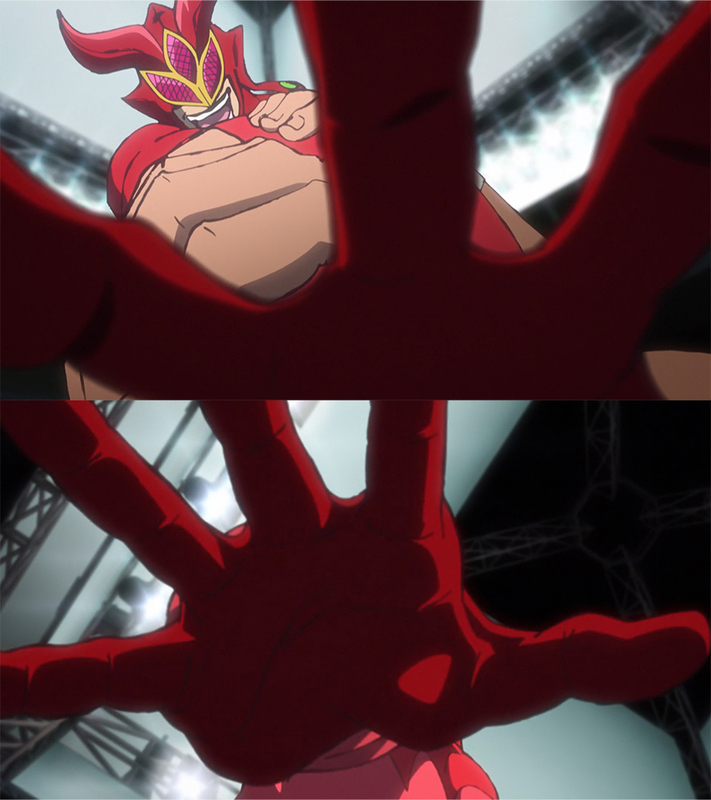 Tiger Mask W offers you a decent look at his rather idiosyncratic art; partly because it really is peculiar, and partly because he’s an animation beast who drew 110 cuts – about 1/3 of the episode – while heavily correcting the rest. Watanabe’s drawings are flagrantly oldschool, and he shamelessly wanders off-model to do his own thing. His principal tell is the prominent cheeks, which appear whenever he’s drawing someone else’s characters and are also quite obvious in his own designs. Even in restrained cases you can still tell the facial structure is different. His powerful usage of rough lineart stands out, whether it’s thin or thick traces, but when it comes to character motion what I find most fascinating is the very way bodies move; they feel as if they have more joints than TV anime usually allows them to, giving them lots of secondary motion. Moreso than in Kamatani’s case however, the episode doesn’t paint the full picture when it comes to Watanabe as an artist. Most hits had a good sense of impact, but the action was conceptually too restrained for him to show off his animation prowess. 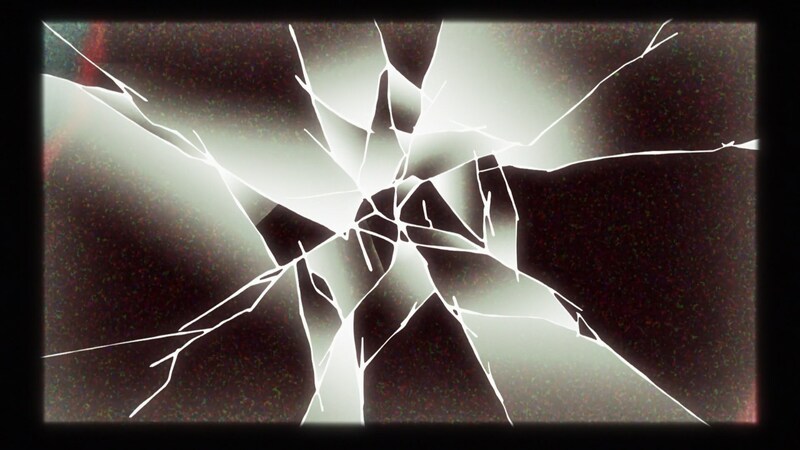 There’s no room for the 2D FX he excels at, often adorned with tiny sparks. As someone with an obviously 90s style, his cartoony drawings are tons of fun, and that obviously wouldn’t have fit in this episode. Thankfully, his art has tons of charisma no matter how he’s employing it, so a limited look at his work is still spectacular. As I mentioned at the beginning, this duo is significant not only because they’re both incredibly talented youngsters that have already gained acknowledgement, but also because of what they represent. Rie Matsumoto and Yuki Hayashi’s heirs meeting is at the very least a beautiful coincidence, as if miracles exist then maybe the beginning of something greater. It’s not as if the original Kyousougiga duo is in needs of a replacement already, but seeing their successors mature so fast fills me with hope. And if someone with more money than financial sense is reading this, they know where to direct their funds if they truly want Neo Kyousougiga. 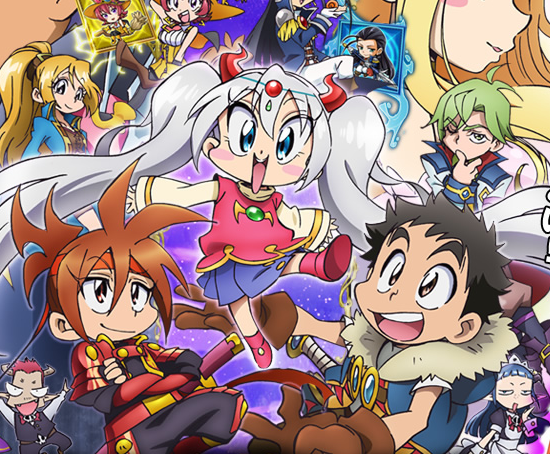 Toei has always been an industry exception, for the good and for the very bad. As a company they’re too big to even be compared to other 2D animation studios, and they embody the eternal conflict of anime as a business vs anime as art better than anyone else; creators are constantly under pressure because of executives who are aware there technically is enough manpower to produce as many titles as they need, even if that means sacrificing quality. And yet it’s also the studio offering animators a union, unlike the rest of the industry. 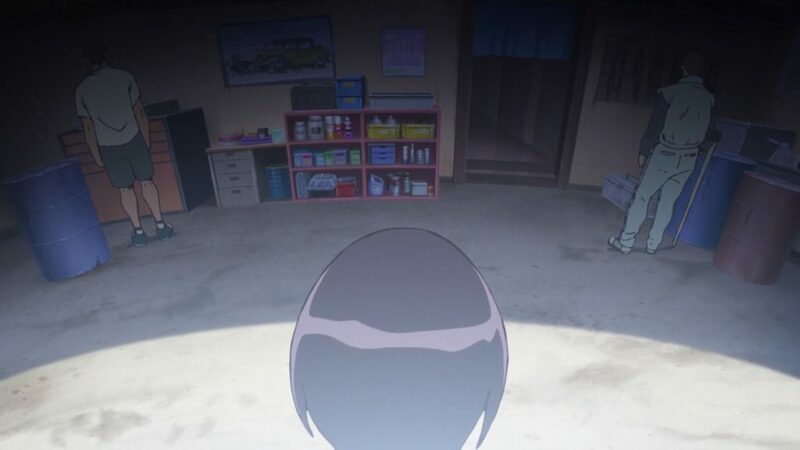 The studio where many of anime’s top directors have their roots. 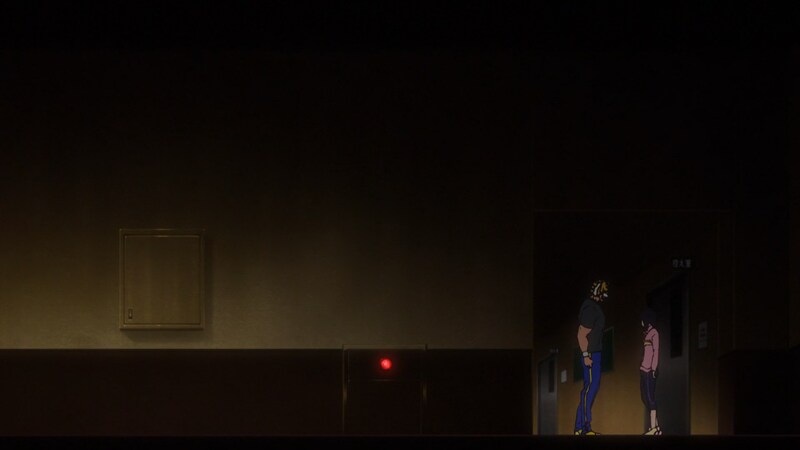 The studio that caused Sailor Moon Crystal to crash due to horrendous decisions, but also the studio that allowed its sequel to be produced with such a strong schedule that some animators forgot what episode they had even worked on many months beforehand. The internet is full of people with really extreme opinions about Toei who don’t really understand the monster they’re yelling at. This post won’t solve that, but at least you might have learned about some of their most interesting creators. You might have heard that this weekend I had the personal chance to check out a couple of pretty interesting movies, but I’m not sure how to tackle them yet. Both will get in-depth posts on the site for sure though! Did you see “Kimi no na wa ” ? I flew to the country right in time to watch Kizumonogatari, watched Koe no Katach on the next day, and then went to a pub with friends while everyone watched Kimi no Na wa. I might eventually watch it but you can take that as my personal statement on Shinkai. Hm, weird, I thought it said the episode director was Yuu Kamatani, not Haruka Kamatani. Did I misread or is it a pseudonym? 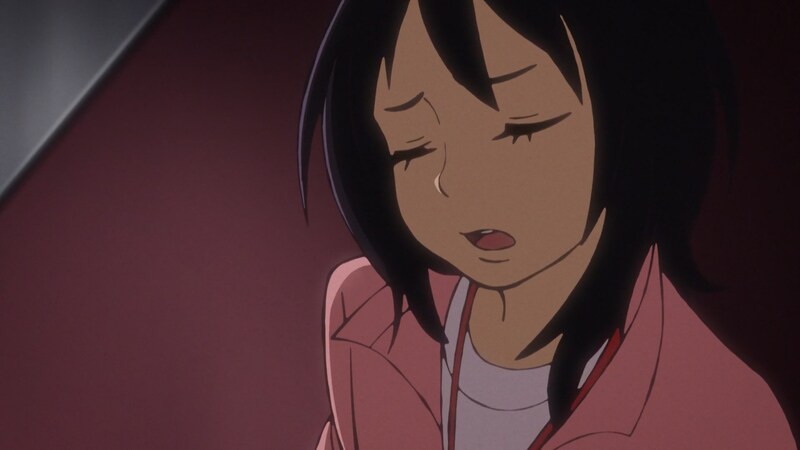 Her name’s Haruka, Yuu was a misreading that pretty much everyone assumed was the right one. We were told by a JP Toei fan who’s acquainted with lots of staff a while back.